Dublin Sinn Féin MEP Mary Lou McDonald has predicted that Sinn Féin will overtake the Labour Party in Dublin in the next five to ten years. 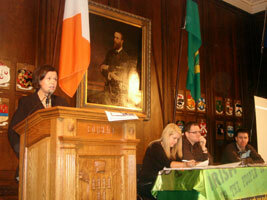 McDonald made her comments at Dublin Sinn Féin’s Annual General Meeting in the Mansion House last Saturday. “As we gather here for our Annual General Meeting, we are in buoyant and confident mood. The party is in election mode in every county on the island and, here in Dublin, we are confident of significantly increasing our Leinster House representation after the general election. We are a party on the move in this city. We have made significant gains in every election in the last decade and will continue down that road after this election,” she said. “The next five to ten years will be crucial for republicanism in this city. We need to set ourselves ambitious but achievable goals. We must overtake the Labour Party in this city in the next five to ten years and I predict we will. In that time I also believe we will become the largest party on Dublin City Council and we will have a Sinn Féin mayor of Dublin. “But to do that we need to set out our stall now. We need to set out our vision for this city and incorporate that into our programme of work and our key campaigns. Central to these will be sorting out the crisis in our health services, delivering quality social housing to our people, developing an integrated, fully-resourced public transport system to get the city moving and end the commuting nightmare,” she said. McDonald formally launched one of Sinn Féin’s key campaigning tools in the capital: Dublin News, almost 200,000 of which will be delivered over the next month. 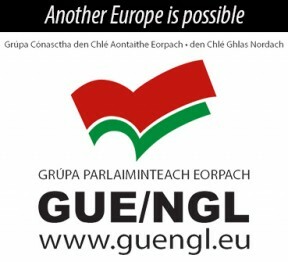 Another issue will be produced in April and the party hopes to increase its circulation to at least 250,000. “This paper brings the republican vision and our goals to the people and our message that we offer a real alternative to the stale politics of the establishment parties. We are quite confident of achieving those goals and realising that vision,” McDonald said.